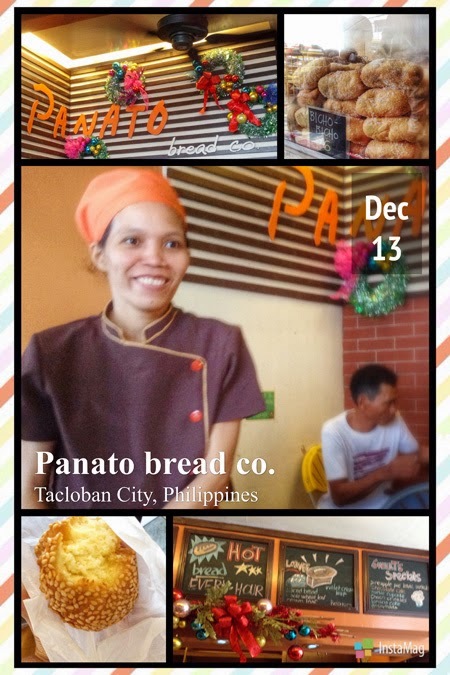 Living Leyte : Panato Bread Co.
Panato bread co. a bakery located at Justice Romualdez St. across the Eye Referral Roman architecture building in TC is both unpretentious and necessary. It's in a small space within the block but because of their dedication to their clientele it is such an added bonus to the people of Tacloban. Hot and newly made Bicho-Bicho and Lubid which are variations of doughnuts are always available. I personally go there for the Kabak, a famous Visayan hardened, deep fried bread, encrusted with sesame seeds because it elicits very pleasant childhood memories from the first crunch to the last. Panato is not an eatery per sé, there's not a lot of customer space but, how about this idea - buy a bunch of Kabak, Bicho-Bicho, Lubid and ice cold Coca Cola, head for the sea in Magsaysay Blvd. park at the side overlooking the water, eat, drink and relax, and tell me if you're not in Paradise.